As the days get longer and warmer, you can't help but dream of days when the garden looks like the image below. It takes a lot of prep work to get there however, and that work starts in February and March here on the farm. Here's a little peek at what we've been up to. A view of the garden in August. Greenhouse prep work starts in February and March. During the months of February and March, several projects including garden and greenhouse clean up, cold crop planting, tilling, swarm trap baiting, seed ordering, and many other activities fill our weekends. Just writing this list out could send any reasonable person into a panic! The key to survival however, is taking it one step at a time and remembering how wonderful it feels when it all comes together. Seed tape and the use of Wall-O-Waters help give planting a jump start during the varied weather this time of year. This is seed tape. Using this planting strategy is very useful for certain types of seeds. Long, dark winter nights are ideal for preparing seed tape. With a little glue, your favorite seeds, strips of paper towel, and some patience, you too can create seed tape. It eliminates the need to thin plants later on, and provides just the right amount of spacing for plants as they develop. I've used this technique for carrots of course, but also for cabbage, cauliflower, broccoli, and even tomatoes to make planting the small seeds as simple as possible. Prepping the soil for wildflower seed planting is another early Spring project. Seedlings emerging in each of the foraging garden beds. Preparations for the honey bee foraging garden typically begin in March. 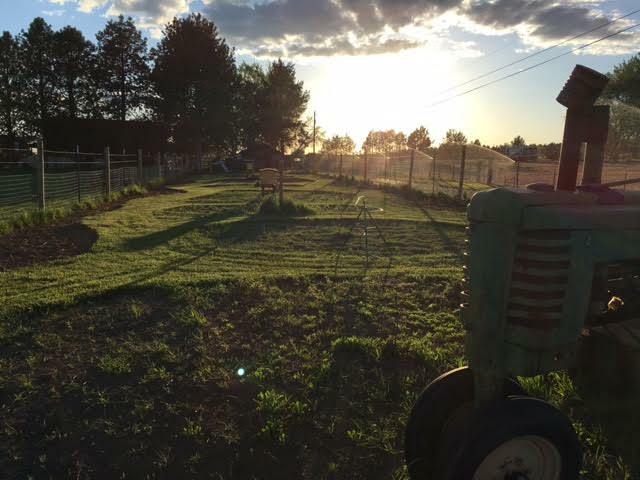 Each of the beds in the 1/4 acre space are weeded, tilled, and seeded for the coming year. The garden will reseed itself, but the dynamic density of flowering we enjoy each year comes from intentional annual seeding. It takes about five pounds of seed to properly prep the foraging areas of our garden. The seed mix includes 18 different types of seed, and we offer the same seed type on our website for anyone interesting in planting for the pollinators. "Baiting" and preparing honey bee swarm traps. Each Spring we place swarm boxes around the farm in hopes of luring and convincing honey bees to relocate on our property. Tempting the honey bees is more complicated than one might think. The box must be placed at a certain height and face the south. Frames with trace amounts of honey comb are always helpful. A hint of lemon grass essential oil always helps as well! Intrigued? There are even books about the subject. My farm helpers find creative ways to move leaf piles from the garden beds in preparation for planting. We've reached the end of our onions from last year's garden. The timing seems just right considering Spring onion planting is on the agenda. Planting hanging baskets for a head start on pretty porch flowers. It isn't all work around here. Thanks to the Easter Bunny, we are proud owners of four new baby chicks. These laying superstars will join the flock once they are big enough to defend themselves. Sometimes people ask me how we manage to do all of these projects. The honest "secret" is patience, pacing yourself, and trial and error. It helps that we love what we do too.